LONDON, UK, February 22, 2017 (ENS) – Come October 23, London Mayor Sadiq Khan will impose a £10 (US$12.45) Toxicity-Charge on vehicles in central London that do not meet Euro 4 standards, typically those diesel and petrol vehicles registered before 2006. The toughest emission standard of any city in the world, the T-Charge, also known as the Emissions Surcharge, will apply every weekday on an estimated 10,000 of the oldest, most polluting vehicles. The T-charge will operate on top of, and during the same operating times, as the congestion charge – Monday to Friday 7am-6pm. 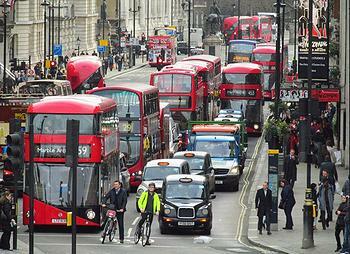 So, it will cost £21.50 (US$26.75) a day to drive a pre-Euro 4 vehicle in central London after October 23. Air pollution in London is a public health crisis and the mayor says he has been forced to take hard-hitting action to tackle it. 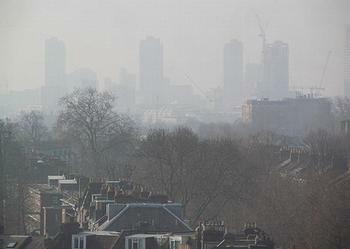 Currently over 9,000 Londoners die prematurely each year as a result of long-term exposure to air pollution, while 438 schools in the capital are in areas exceeding legal air quality levels. “Londoners overwhelmingly support my plans to introduce this £10 charge because they feel when it comes to battling pollution the time for action is now,” said the mayor. To help motorists get ready for the new charge, on Friday the mayor launched a free online vehicle checker on the Transport for London website so that drivers can check whether their vehicles will be affected. “To help drivers we have created an online compliance checker, which can be found on the TfL website, that enables people to easily establish whether they will be affected by the charge and get advice on what action, if any, they need to take,” said Daniels. To view the new compliance vehicle checker visit www.tfl.gov.uk/emissions-surcharge. The mayor has doubled funding spent on improving air quality to £875 million over the next five years and will be consulting on introducing the central London Ultra Low Emission Zone in two years. “The T-Charge is a vital step in tackling the dirtiest diesels before I introduce the world’s first Ultra Low Emission Zone as early as 2019,” said Mayor Khan. He plans to expand the ULEZ to the North/South Circular roads and making it London-wide for heavy vehicles as early as 2019. 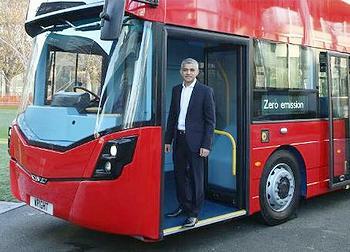 Mayor Khan also is spending more than £300 million transforming London’s bus fleet by phasing out pure double-deck diesel buses; he has committed to purchase only hybrid or zero-emission double-decker buses from 2018. 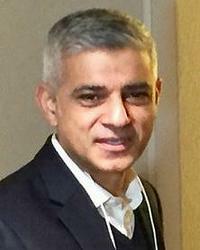 A broad cross-section of London influencers support the mayor’s moves. “This emissions surcharge is an important step towards the introduction of the Ultra-Low Emission Zone which will help tackle the issue of air quality head on,” he said. Chief Executive of Living Streets, Joe Irvin, says the T-charge will get people out of their cars and walking. “Encouraging Londoners to take to their feet will not only relieve pressure on our transport system but will ensure people living and working in the city can breathe better air and enjoy better health,” he said. 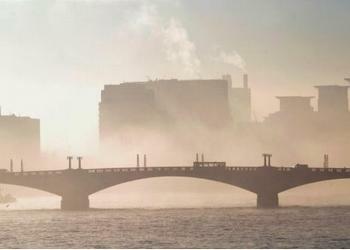 The mayor wants to work with the national government to help tackle dangerous air pollution. He is urging government actions that include setting up a diesel scrappage fund and producing a 21st century Clean Air Act. A national dirty diesel scrappage fund would financially compensate motorists and enable government to tackle killer toxic air. Proposals include £3,500 for up to 70,000 polluting London van and minibus drivers to buy cleaner vehicles. There’s a proposal for a £2,000 credit to help low-income London families scrap up to 130,000 cars and £1,000 to help scrap London’s oldest taxis. The 21st century Clean Air Act would provide a legally enforceable right to clean air. Standards currently enforced by the European Union and the UK government could introduce new powers to better regulate all sources of emissions, not just road transport, and give powers to local authorities. Mayor Khan says London needs additional powers to manage toxic emissions such as pollution from construction sites and river traffic and, he adds, increased funding is essential.